Posted below is part 3 of a column I wrote for RenewAmerica in 2011 in which I revealed that religious syncretism (a blending of many different belief systems) has virtually reshaped the visible Church. I wasn’t alone in pointing out this fact. There were many others in the online apologetics and discernment ministries who were sounding the alarm. In light of what is going on in many churches, it is clear that the warning cry of “discerners” has been largely ignored and now the visible church is in considerable disarray. Not only were we not listened to, we’ve been marginalized, and in some cases hated, for exposing the apostasy that has changed the face of evangelicalism. My primary focus for part 3 of the series is to show how Gnosticism and Man-centered Psychology has gotten a firm grip on Christendom. How did this happen? 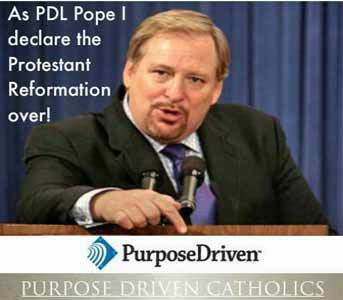 In large part it happened because undiscerning Church leaders thought it was a good idea to adopt the Rick Warren “Purpose Driven” marketing strategy to grow their churches.